This large, elongated near-shore fish is a dark copper to pale silver color, with a distinct eye spot at the tail. It is very tolerant of water temperature variations as well as salinity levels so it ranges in a wide variety of habitats from surf zones and seagrass beds to estuaries and river mouths. It is named for the drumming or croaking sound it can make with its swim bladder and abdominal muscles. The red drum is a very popular recreation sport and food fish, growing to 40 inches on average, and is also a popular fish in public aquariums. English language common names are red drum, red fish, puppy drum, reds, red bass, spot tail, channel bass, bull red, rat red, and tropical sea bass. Other common names include corvina (Spanish), corvinão-de-pintas (Portuguese), corvineta ocelada (Spanish), punarumpukala (Finnish), rødhavgjørs (Norwegian), röd havsgös (Swedish), rød trommefisk (Danish), röd trumfisk (Swedish), roter trommler (German), roter umberfisch (German), tambour rouge (German), and tambour rouge (French). 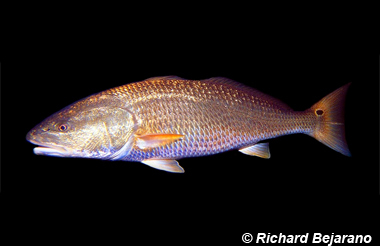 The red drum is one of the most popular recreational gamefishes off the U.S. Atlantic coast and in the Gulf of Mexico. It is of minor importance to commercial fisheries, however this species is raised for human consumption through aquaculture efforts. The flesh is considered tasty with younger fish being more tender and flaky in contrast with older fish that have a texture more similar to chicken. It is often displayed in public aquarium facilities. Red drums pose no danger to humans. Where red drum is present, there is slot restriction as well as limits on the number of allowable fish per person. Check with your local fish and game to find out your state’s slot size and limits. Thanks to the slot size limits and the demise of commercial fishing for this species, the red drum has made a recovery in recent years. The red drum has not been evaluated by World Conservation Union (IUCN). The IUCN is a global union of states, governmental agencies, and non-governmental organizations in a partnership that assesses the conservation status of species. 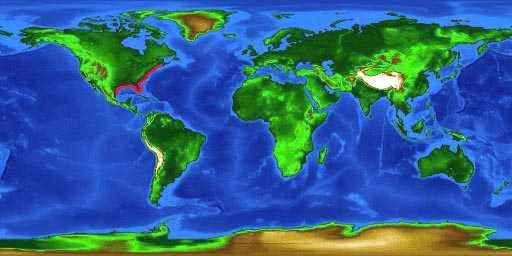 World distribution map for the red drum. The red drum is a euryhaline fish distributed along the Atlantic and Gulf of Mexico coasts from Cape Cod, Massachusetts to Tuxpan, Mexico. As a nearshore species, the red drum is distributed over a wide range of habitats including estuaries, river mouths, bays, sandy bottoms, mud flats, sea grass beds, oyster bottoms, surf zones, and continental shelf waters. Young red drums inhabit mainly estuaries, river mouths and shallow coastal waters until age three to four. At this age, they tend to leave the protection of estuaries, moving into open coastal waters. Drums can be observed solitary or exhibiting schooling behavior. 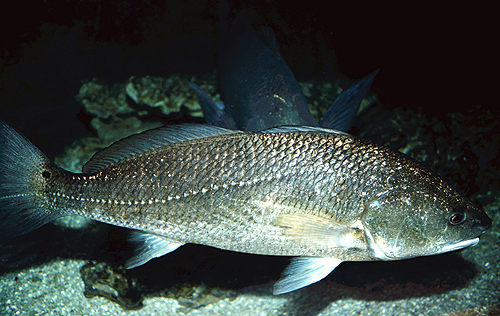 They have been known to school with other species including black drum and tarpon. Adult drums travel back into estuaries and shallow waters to spawn. Red drums can tolerate a wide range of temperatures, anywhere from 39-93°F (4-34°C). Reds can also tolerate wide ranges of salinity. Although they have been known to travel into fresh waters as well as into very high saline waters (up to 50 ppt), adults usually stay in saltwater of 30-35 ppt. The body of the red drum is elongate with a slightly arched back and sloping head. It has a blunt snout with a large sub-terminal mouth similar to most species in the Sciaenidae family. There are two dorsal fins, the first of which has ten hard spines and the second with one hard spine and numerous soft rays. The caudal fin is slightly concave. 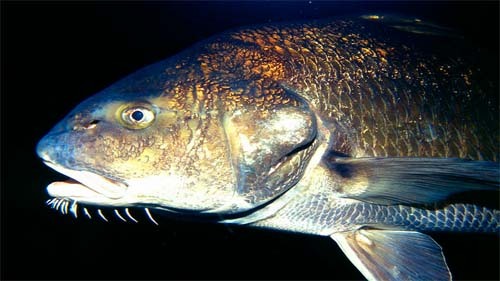 The red drum can be distinguished from the closely related black drum (Pogonias cromis) by its lack of barbels. The red drum is usually a copper reddish color. Coloration can also range from a deep dark copper to an almost silvery sheen. The ventral side is usually a lighter color to almost white. Red drums have a distinctive black spot near the base of the tail. One spot is most common however some individuals exhibit several spots. 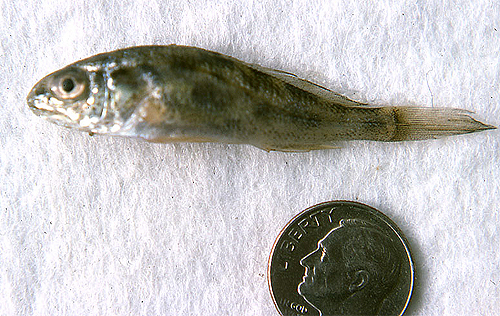 When first hatched larval red drum are a standard length of 6-8 mm. This drum reaches maturity between three and four years of age. The maximum reported length is 61 inches (155 cm) total length (TL), however this species is more typically seen at lengths of about 39.4 inches (100 cm) TL. 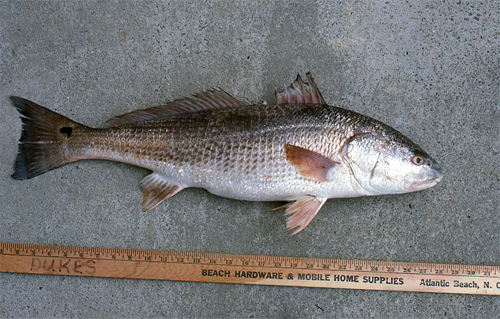 The maximum published weight of the red drum is just under 100 pounds (45.0 kg). It is known to live at least to 50 years of age. Young red drum prey upon small crustaceans and marine worms. As the drum reaches lengths above 200mm, the diet shifts to incorporate small bony fishes including Menidia peninsulae, Microgobius gulosus, Cyprinodon variegates, and Leiostomus xanthurus, among others. Adult drums also feed on larger crustaceans such as the blue crab (Callinectes sapidus). Spawning usually takes place from mid-August to mid-November, often near tidal inlets. Drums are known to make a characteristic drumming noise during spawning. Females can produce one-half to two million eggs per season with each egg measuring approximately 1.0mm in diameter. Eggs hatch at approximately 28-30 hours after spawning resulting in larvae that are about 6-8 mm standard length. These larvae are transported into estuaries via currents before settling onto seagrass beds. Juveniles and sub-adults typically stay in bays and estuaries until age three to four at which time they leave the estuary and join mature adults in coastal waters. The main predator of the red drum is humans. Other predators include birds of prey including ospreys, as well as larger fishes. The black tail spot is thought to be used as mechanism to confuse predators into attacking the tail instead of the head. Juvenile red drums are the intermediate host for Contracaecum multipapillatum, a nematode. This parasite infects the kidneys while waiting for maturation until it resides in the definitive host – birds. Red drums can become infected internally with other parasites in the intestines, stomach, muscle, liver, and the heart. Specimens have been reported with external parasites on the gills, skin, scales, and fins. Red drums have also been documented with benign tumors.